Release Yourself from the Marble | Conduit of Joy! I was one of the hundreds of people, that was fortunate enough to see Michelangelo Buanarotti’s statue of David yesterday. An interesting fact about this statue is that this portrayal of David, as naked, and without Goliath’s head was a new way of sculpting the presentation of this biblical story. This David is pictured in the moment before he attacks Goliath. In this pose David is full of potential, poised for action. His expression speaks to his confidence in his abilities in defeating the giant. With this statue’s nakedness, Michelangelo was said to have been portraying man’s perfection. The fact that this statue is portrayed as uncircumcised, was to represent every man. The statue’s skull is slightly oversized, represents the fact that man can overcome any problem by using his ability to reason. Our minds, and our awareness are our greatest weapons. With our reason and our intuition we have the potential to overcome any challenge in our lives. Michelangelo is rumoured to have said that he did not sculpt, he simply released the sculpture from its imprisionment in the block of marble. Like the artist’s duty to free the sculpture, it is also each of our own duty’s to free our own potential. Like David, everyone is perfect. We must only release that potential from the block of marble that surrounds us. We do not need to invent, merely to remember the nature of our true selves. This entry was posted in Divine. Bookmark the permalink. 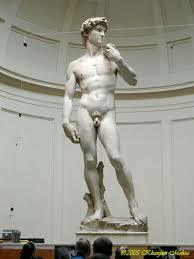 When I was visiting Italy in 2007, I was stunned by the statue of David. Seeing pictures vs. seeing it in person were like night and day. It’s amazing to stand there and truly take in what one person can do (well, one TALENTED person) from a vision.